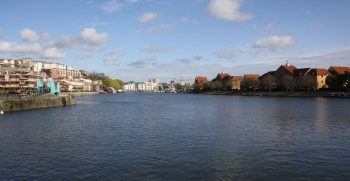 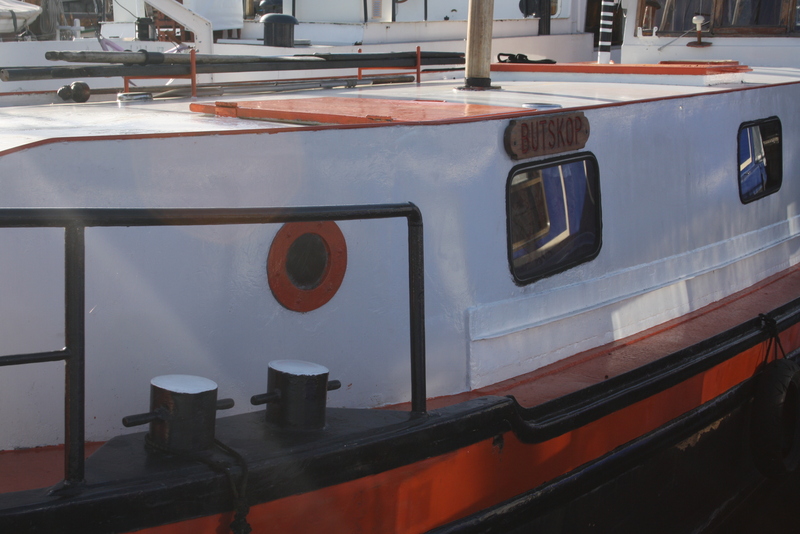 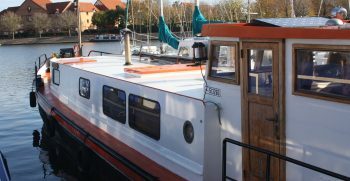 “Butskop” was built in 1925 and converted to a leisure vessel. 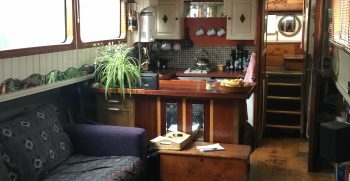 It has been tastefully done throughout with ample room for a single person, couple or small family. 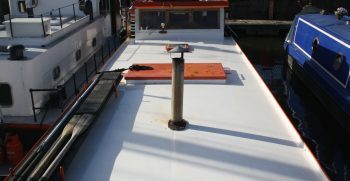 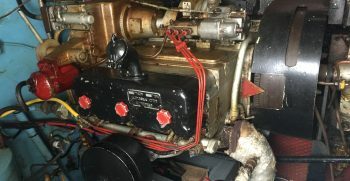 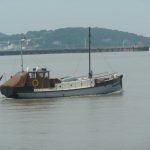 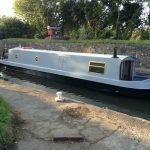 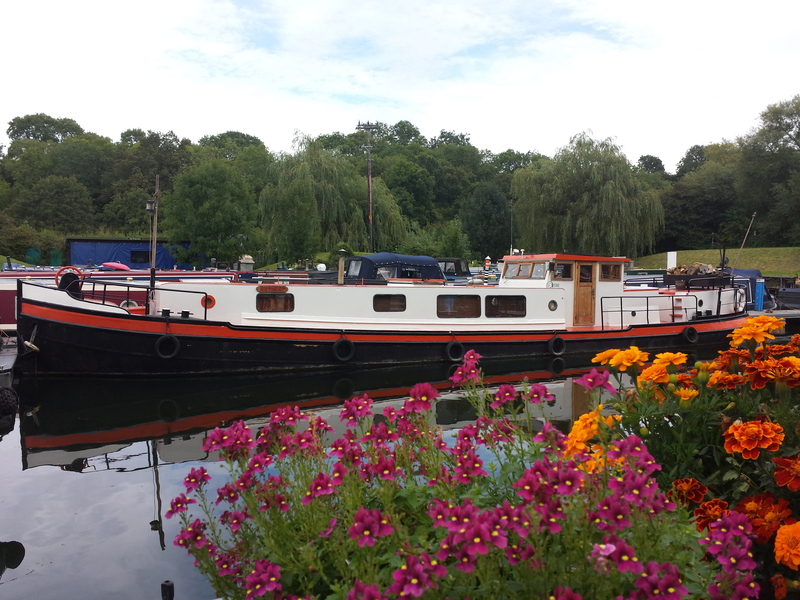 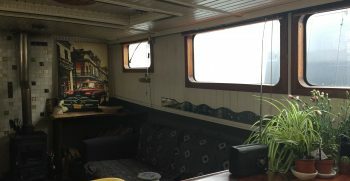 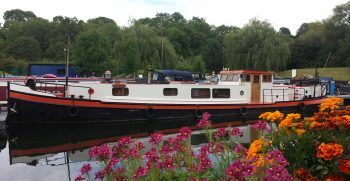 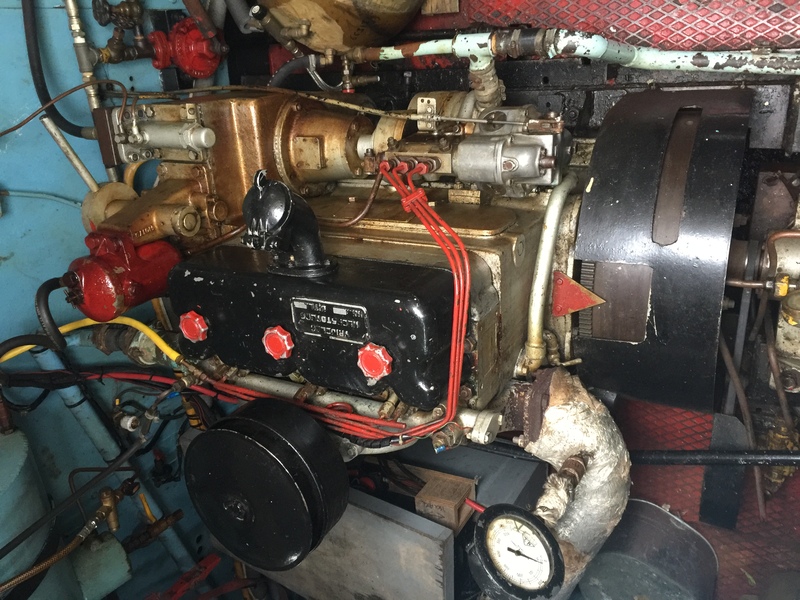 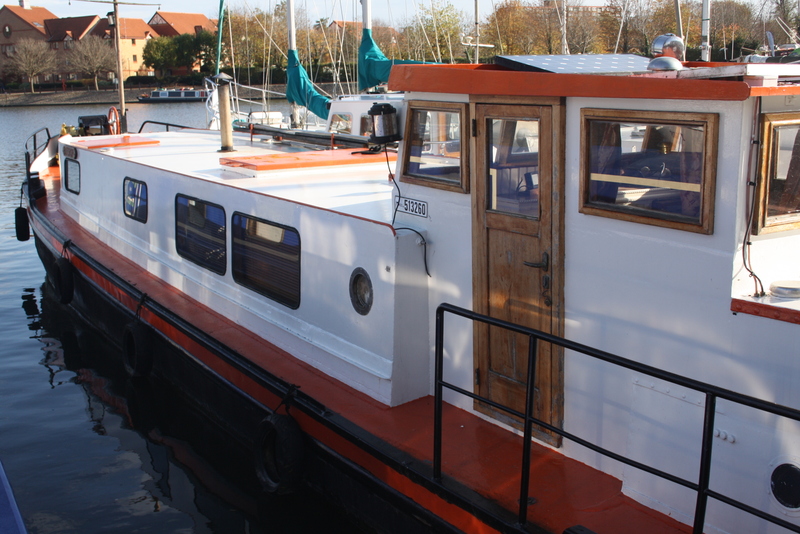 Powered by Kromhout Viertact diesel engine, she is mechanically fully functional but would also make a great home afloat as there is the possibility of a liveaboard mooring. 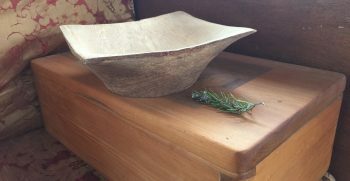 A unique vessel which is extremely eye catching and versatile. 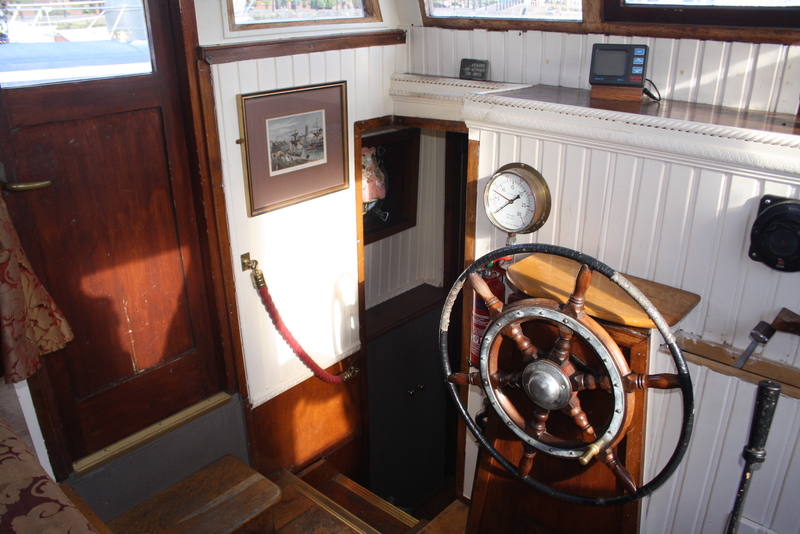 Butskop has solid oak wood flooring throughout and the walls are predominantly painted tongue and groove. 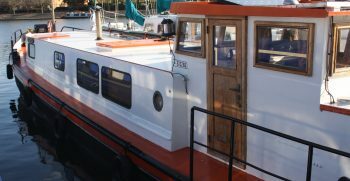 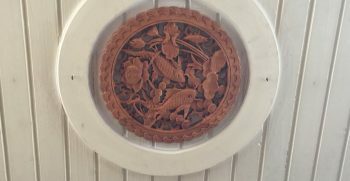 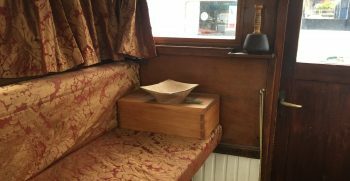 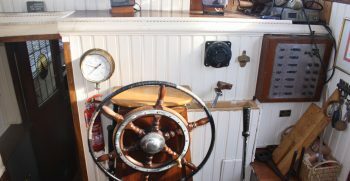 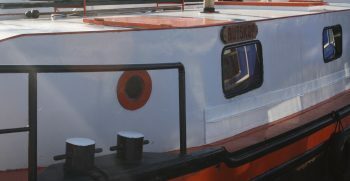 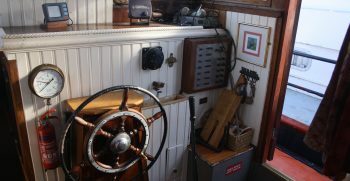 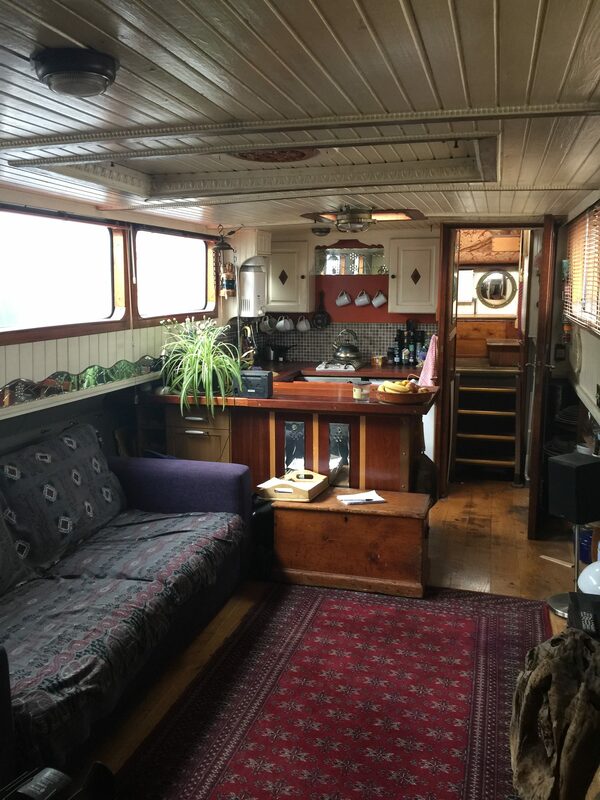 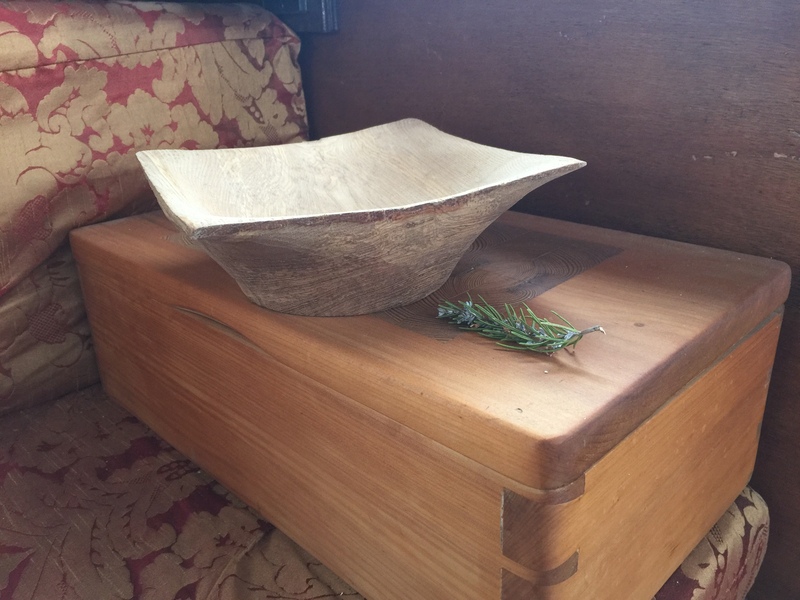 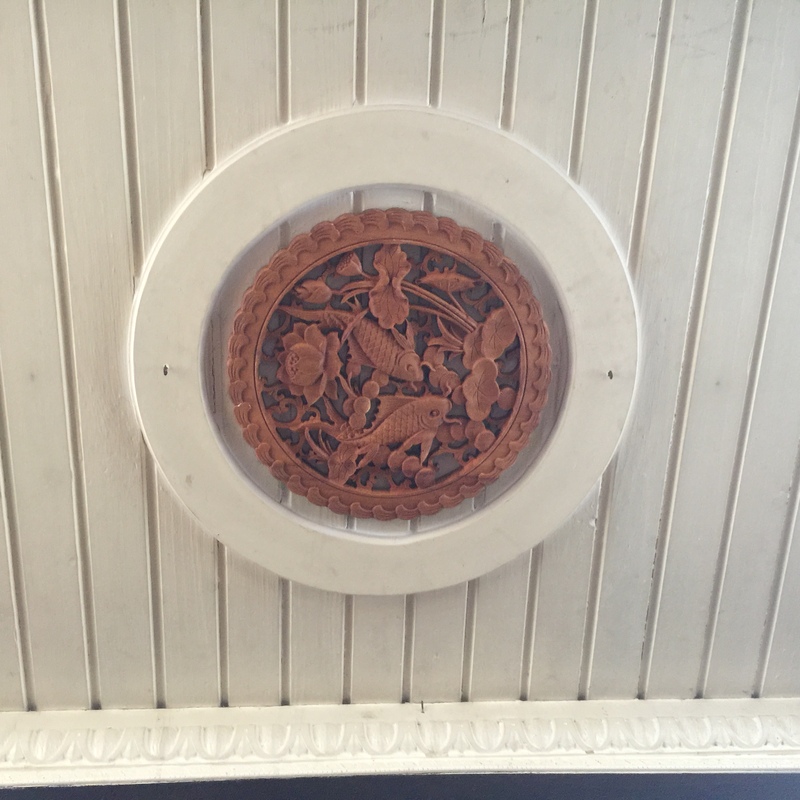 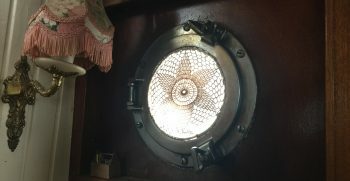 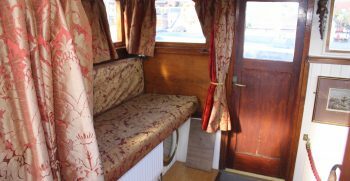 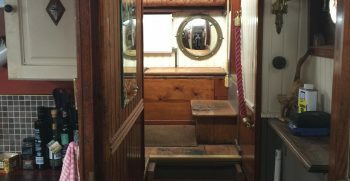 There are beautiful finishing touches and quirky features such as original portholes, architectural mouldings and stained glass that make this a completely unique boat. 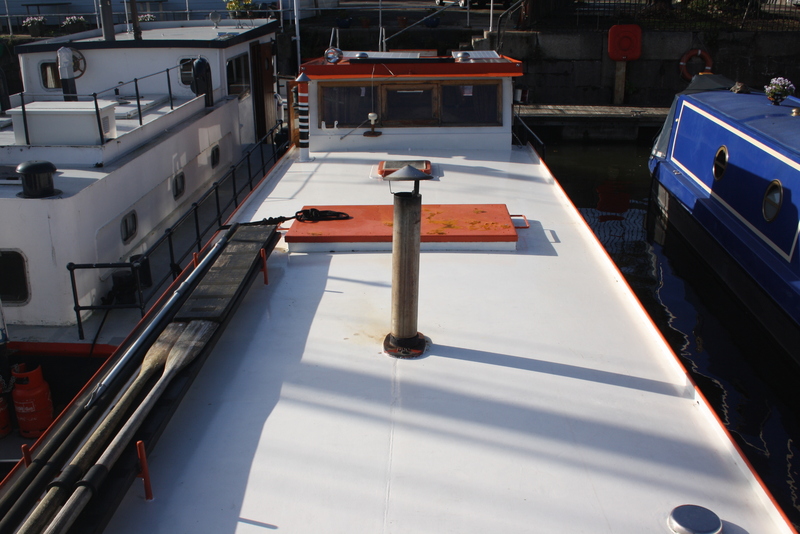 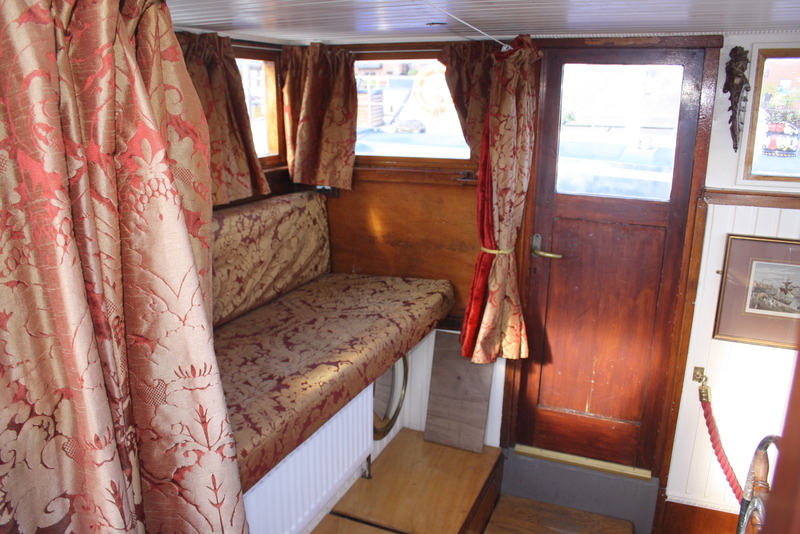 In the main cabin there is a fixed double bed from the forward bulkhead (awarthships). 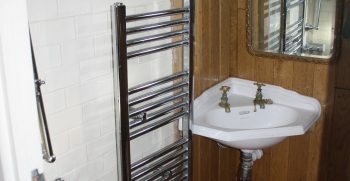 A single radiator is to the right of ample freestanding storage. 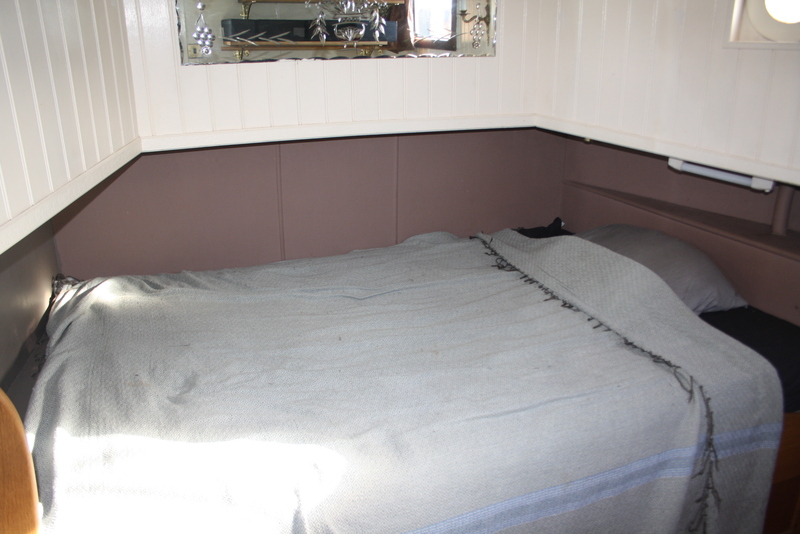 Above the bed is an escape hatch to the ceiling and the cabin comes with mains and 12 volt lighting. 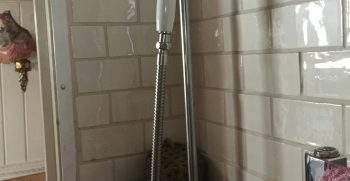 With ceramic wall tiles and mosaics to the floor, the wetroom consists of a Victorian wall mounted ceramic corner basin with brass taps. 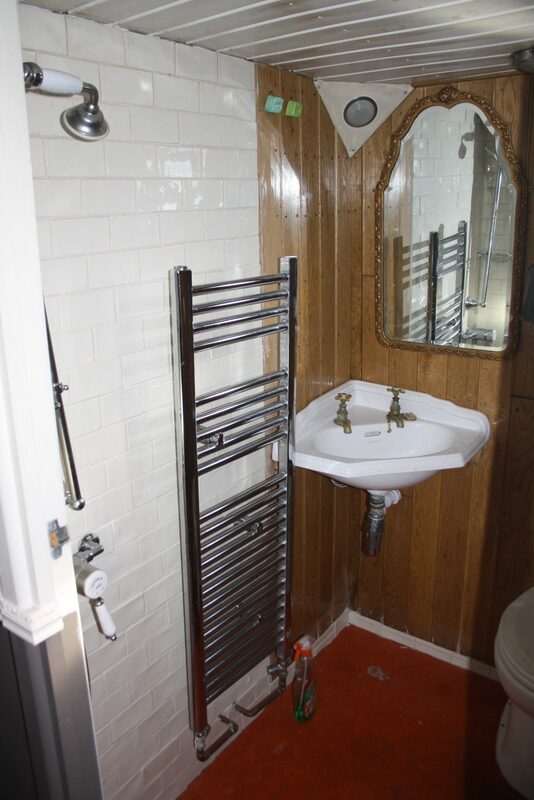 A heated towel rail sit on the wall to the right of a Victorian style shower, and there is a jabsco toilet which goes into a holding tank. 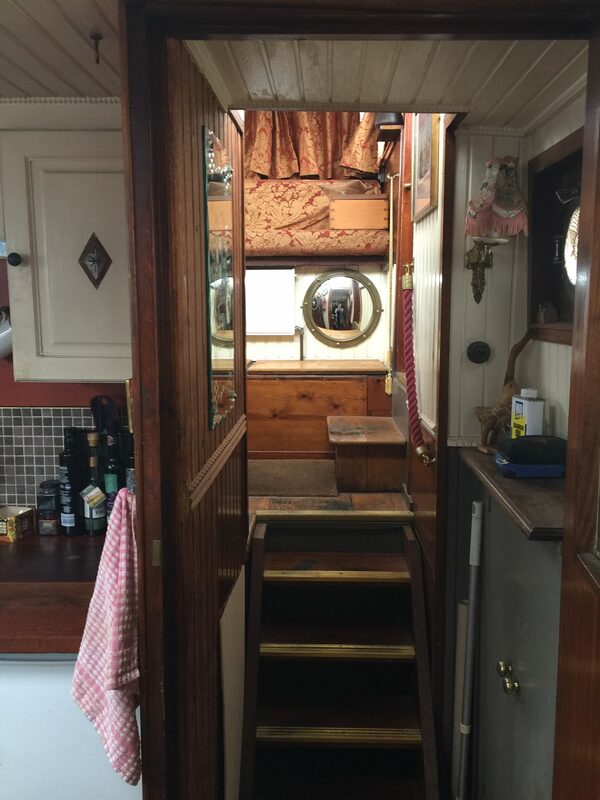 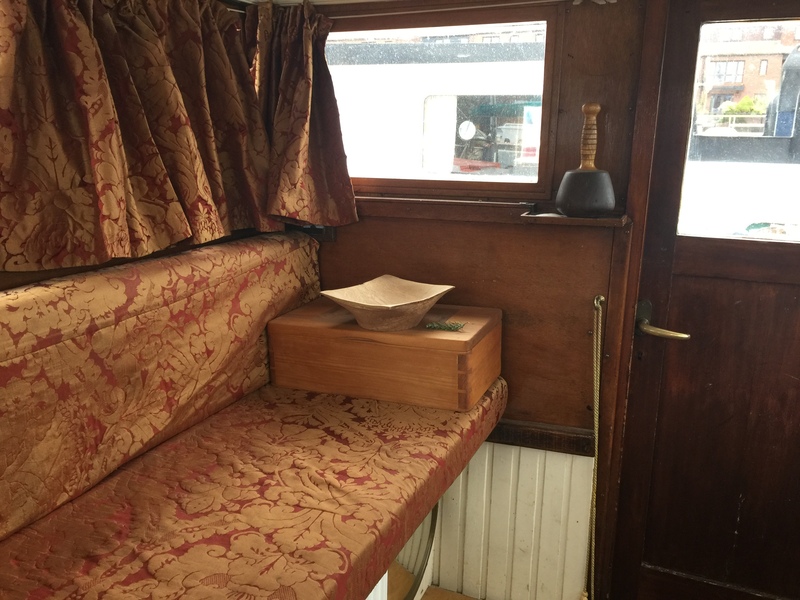 The saloon has a light and airy feel due to the open plan into the galley. 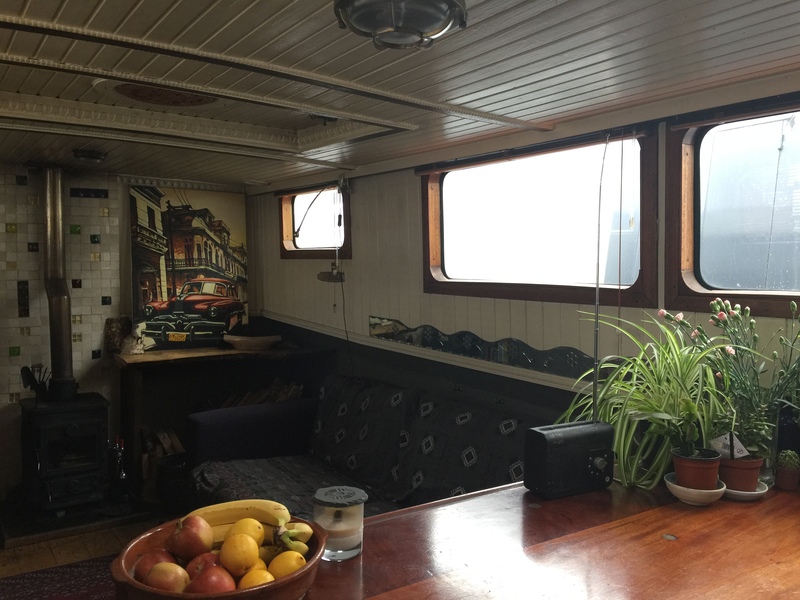 Ample windows give lots of natural light and it has a cosy morso multi-fuel stove with a back-boiler to economically heat all the radiators onboard. 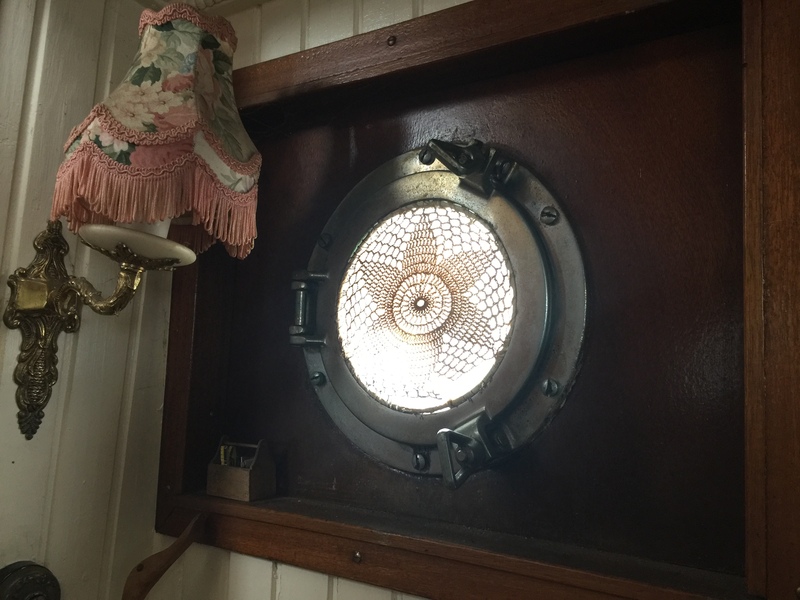 There is a decorative escape hatch and mains and 12 volt lighting. 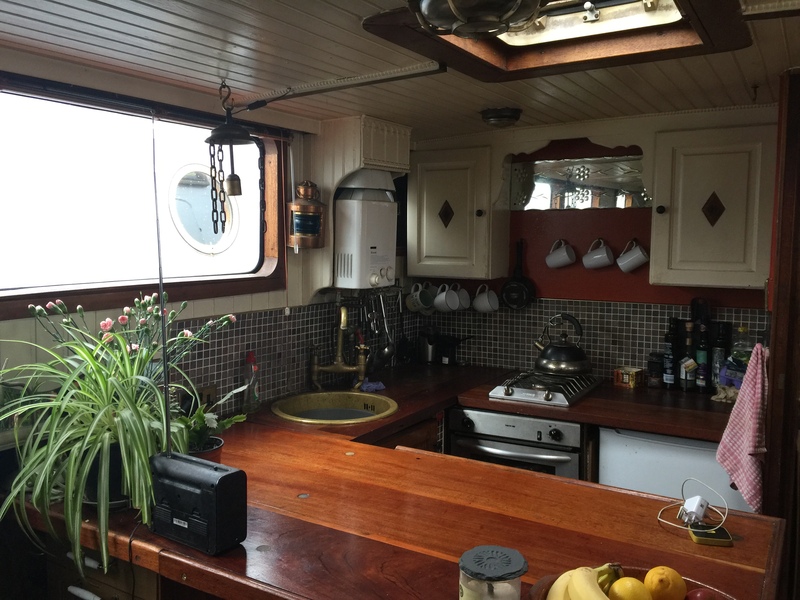 A traditional U shape galley which has everything you could need. 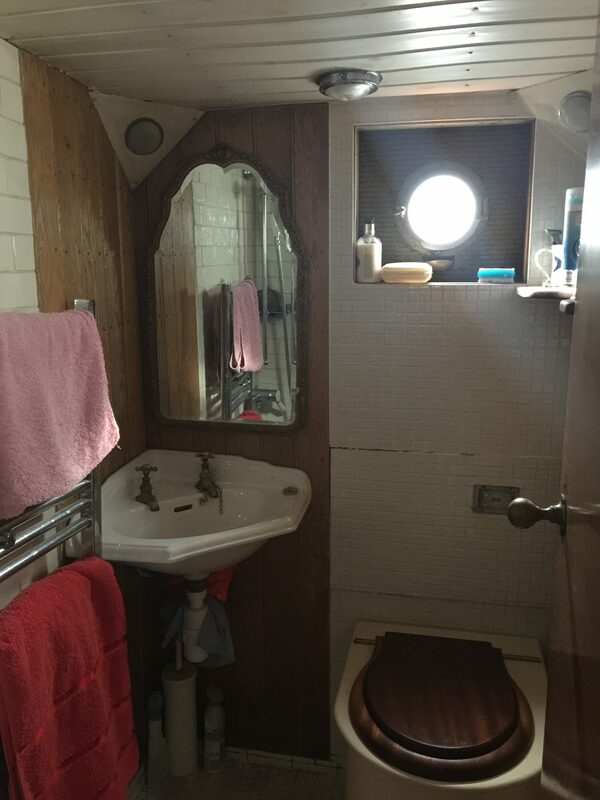 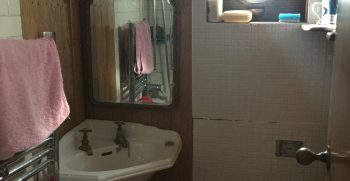 Mosaic tiles on the walls and a brass sink and taps with solid wood counter tops. 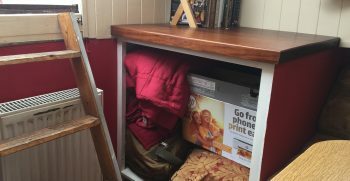 There is a plenty of storage and drawers and wall mounted cupboards which have all been bespoke made. 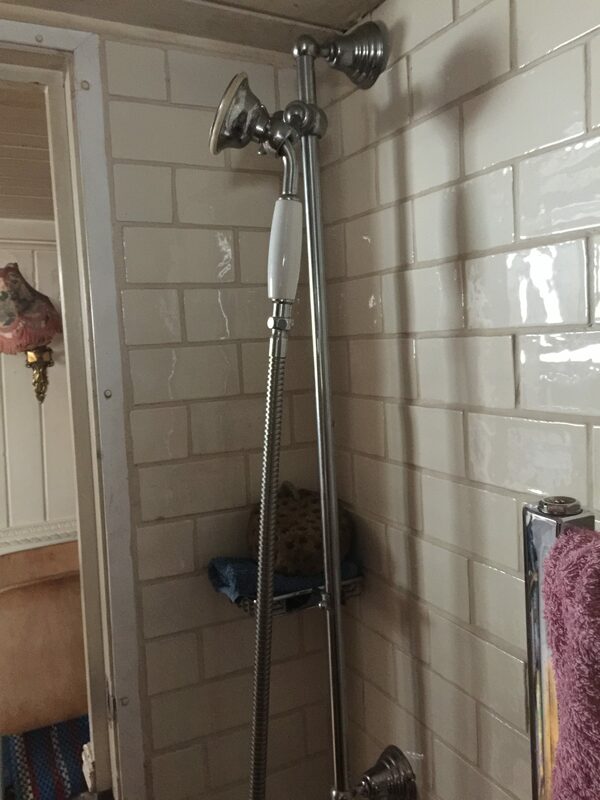 A Rinnai instantaneous boiler heats all the hot water. 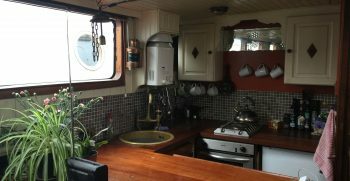 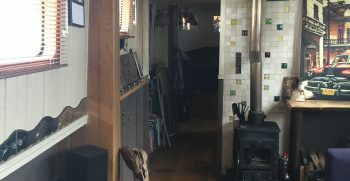 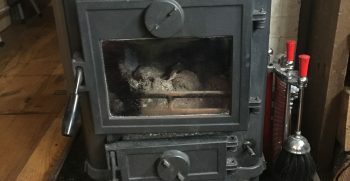 There is a mains fridge and a Thetford marine gas oven and grill with a two ring Smeg gas hob. 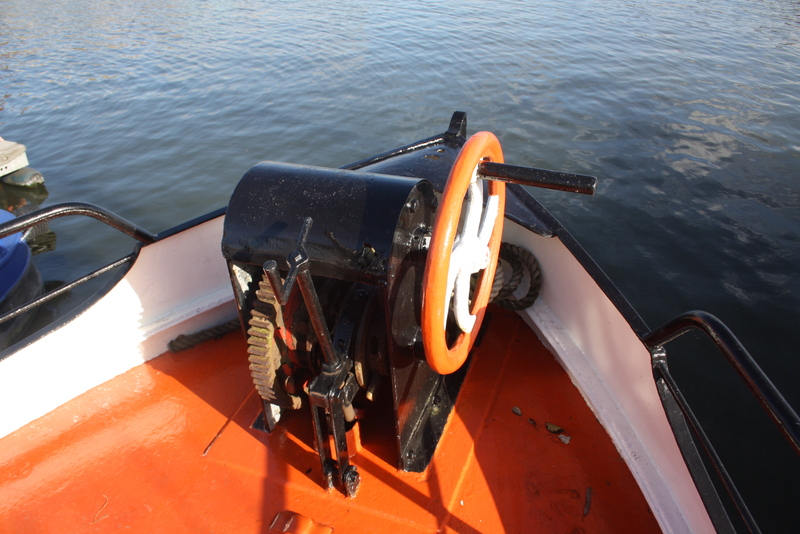 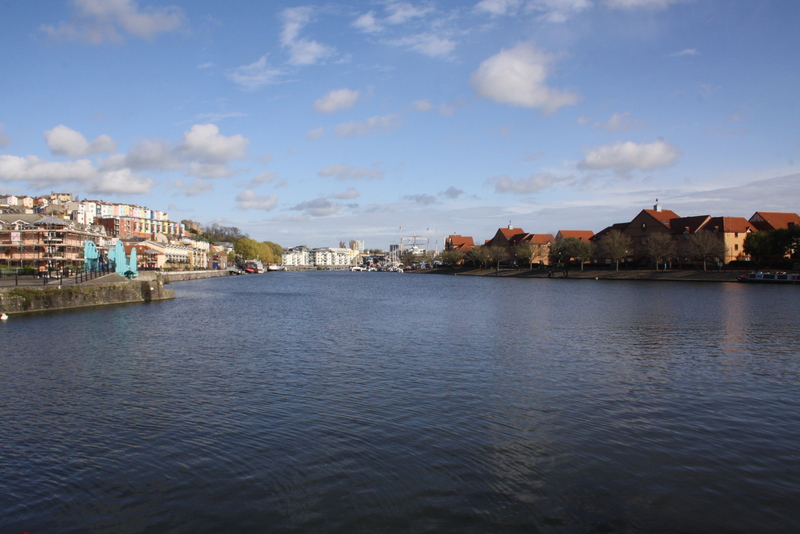 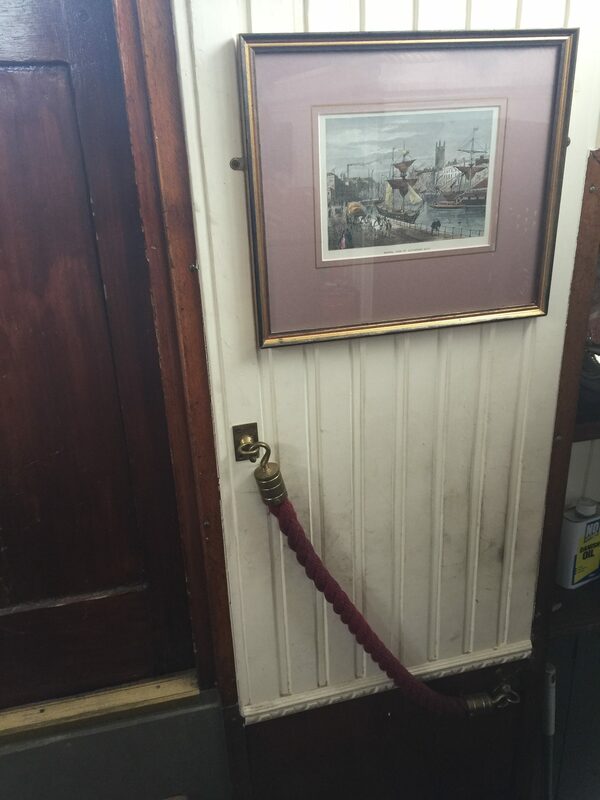 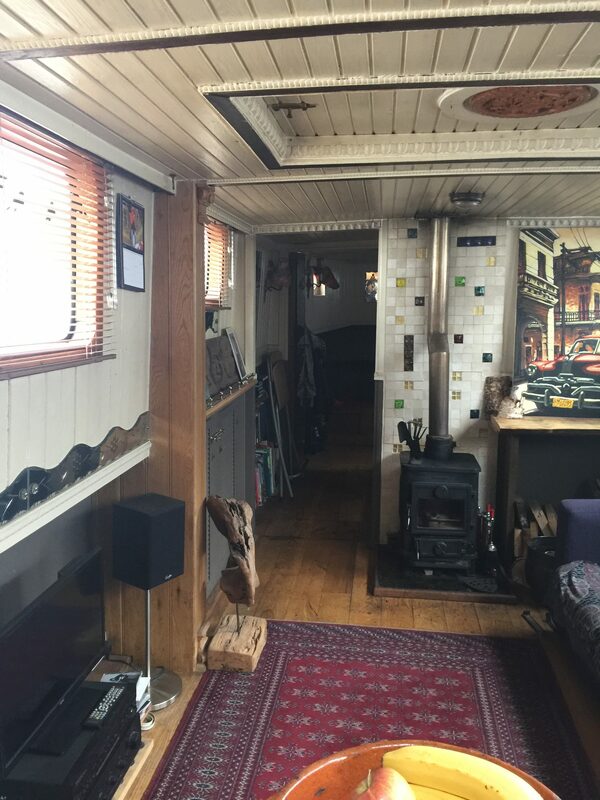 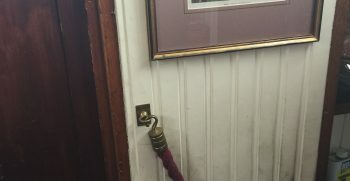 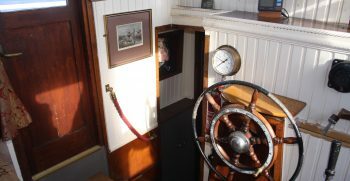 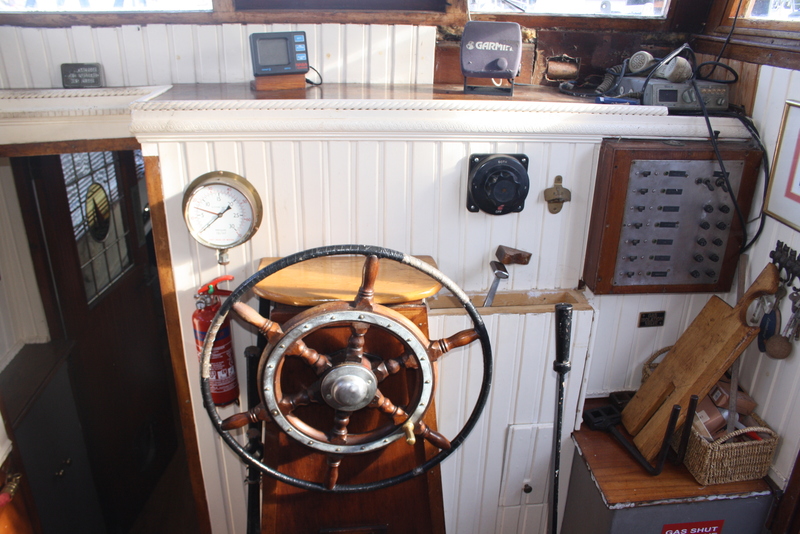 You can enter the wheelhouse from either the port or the starboard side. 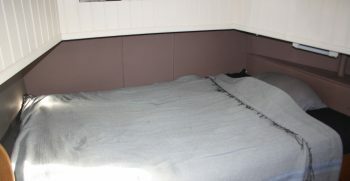 It has a lovely day bed and a single radiator. 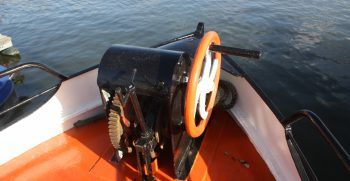 Single forward and reverse throttle and a separate forward reverse control. 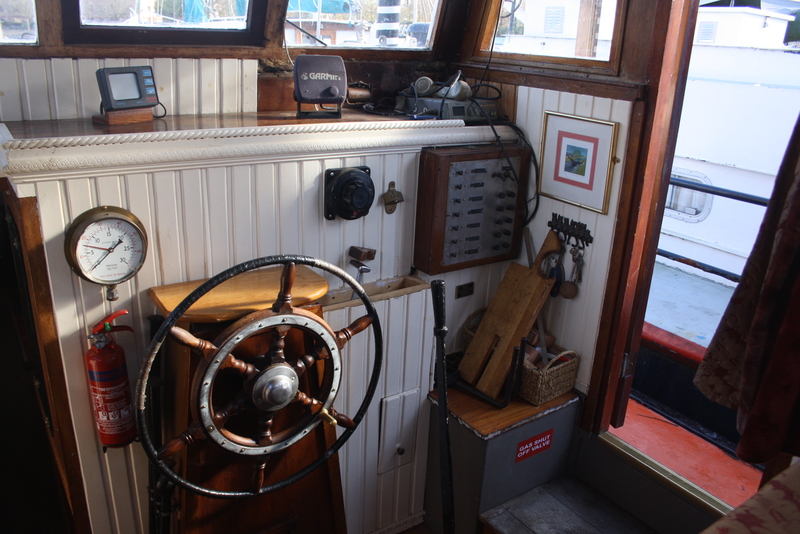 Double isolator switch to helm, a Garmin GPS128 and a NASA marine depth finder and a 7 Switch gang fused ac panel give you everything you need to take her out into open water. 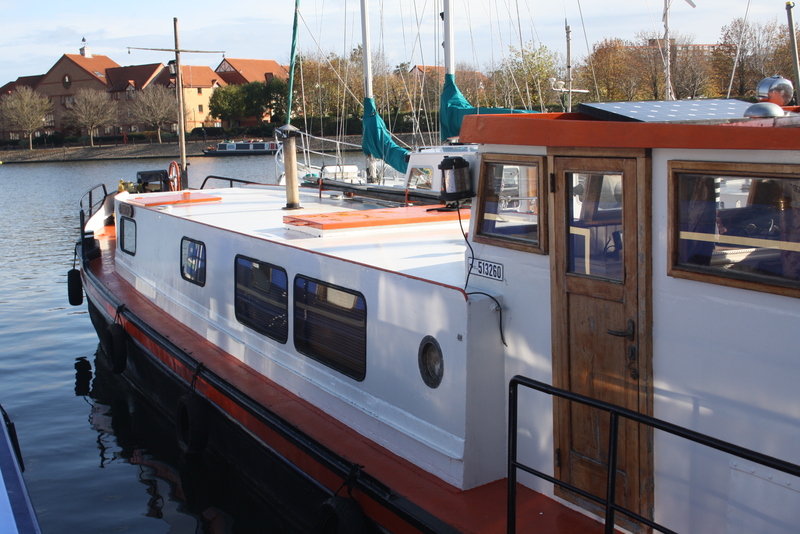 The aft cabin is a completely separate and self contained accommodation perfect for guests or children. 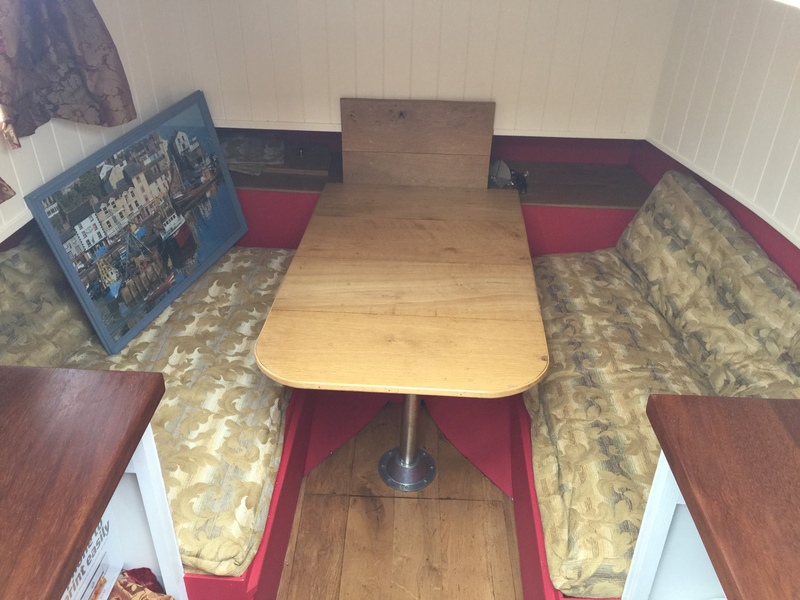 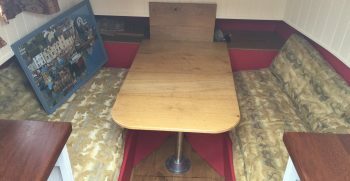 Down the steps there is a table with built in seating either side which converts into a double bed. 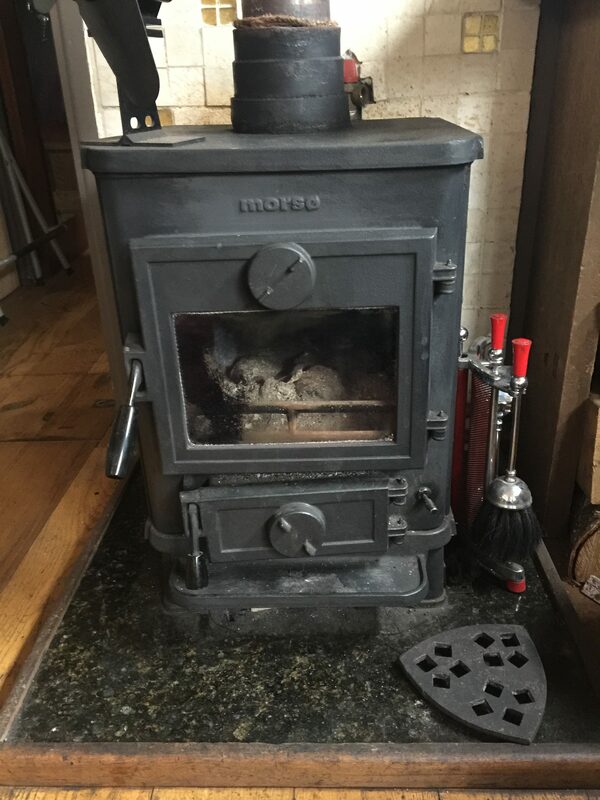 A single radiator heats the room and it has 12 volt lighting, painted tongue and groove and solid wood flooring. 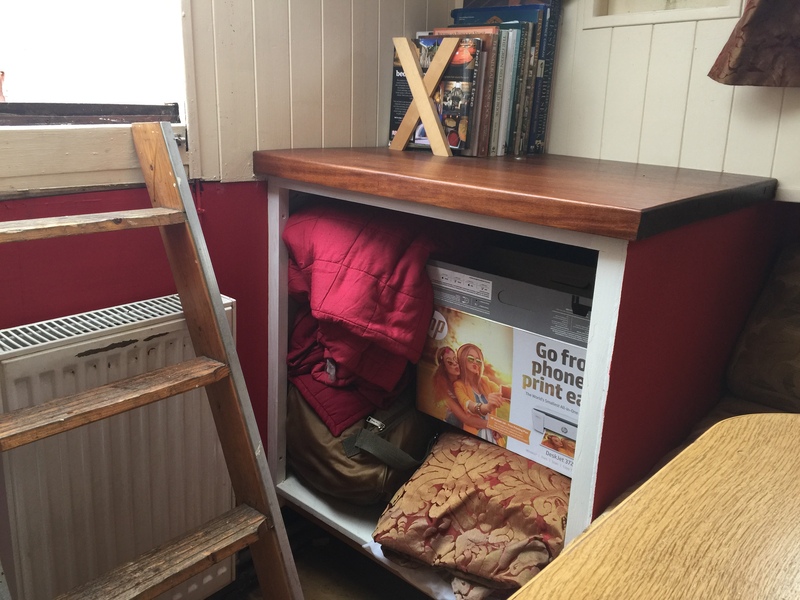 There are two built in cupboards and hardwood shelving. 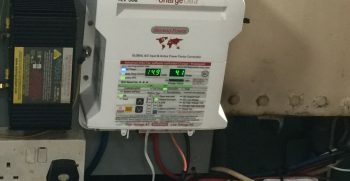 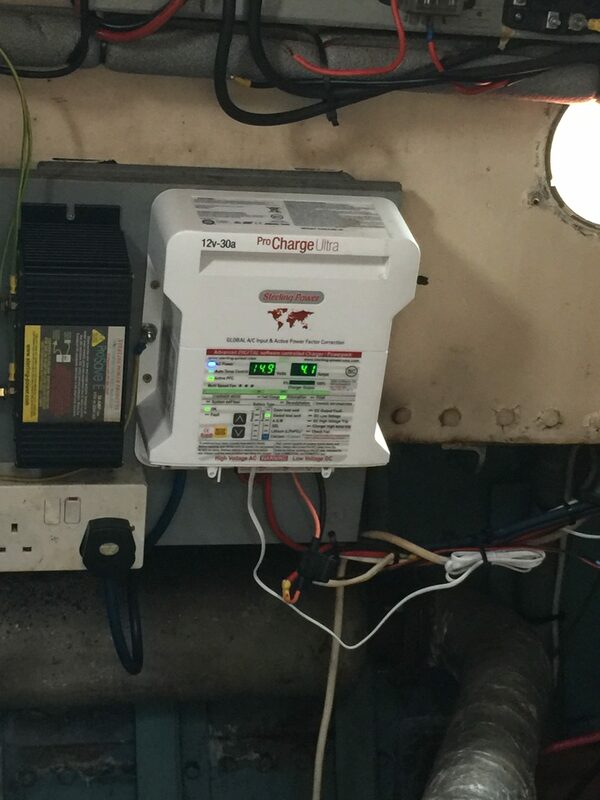 Butskop also has photaic cells for ac charging of solar panels.